EELS: A tool for investigating biological materials | Gatan, Inc.
Electron energy loss spectroscopy (EELS) is the analysis of the energy distribution of the electrons that have passed through a thin sample and have interacted with it inelastically. EELS is a very powerful technique capable of providing chemical and electronic information from particular areas in the sample. Spatial information can be obtained using two approaches: the first method is to combine EELS with a scanning transmission electron microscope (STEM) where the electron probe is scanned across a selected area in the sample and an EELS spectrum is collected point by point across the scan giving a spectrum image (SI). The second method is to use energy-filtered transmission electron microscopy (EFTEM). EFTEM utilizes a special spectrometer which has the capability to filter the energy of the electrons that have interacted with the specimen. Concentrating on a particular ionization edge it is possible to build up images which show a two dimensional distribution of a particular element. Unstained biological materials are traditionally difficult to analyze in the TEM as they show very little contrast and more importantly, they are quite sensitive to the electron beam. The sample can be easily damaged by the electron beam if extra care is not taken when performing the experiment. Biological materials are almost entirely composed of carbon and in some areas they show other elements in small amounts. EELS is well suited to study such materials given its high sensitivity to light element and collection efficiency. Both EFTEM and EELS SI approaches have been used to reveal the elemental distribution across a selected area in a sample obtained from human autopsy tissue. The sample was fixed in formalin and glutaraldehyde, post fixed in osmium tetroxide and uranyl acetate, dehydrated in ethyl alcohols and propylene oxide and embedded in epoxy resin. The TEM sample was also coated with 5 Å carbon on both sides using the PECS instrument. This coating is extremely important in order to prevent any charging effect due to the electron beam travelling through the sample. TEM samples were kindly provided by Dr. Wenlang Lin at Mayo Clinic in Jacksonville FL. The same area in the TEM specimen was analyzed in both EFTEM and EELS SI modes. The TEM microscope used for this experiment is equipped with a LaB6 electron source and in STEM mode a 10 nm probe with a current density of 1.6nA/cm2 was used. The area chosen for both experiments shows the presence of a feature that has been identified as a cell nucleus. 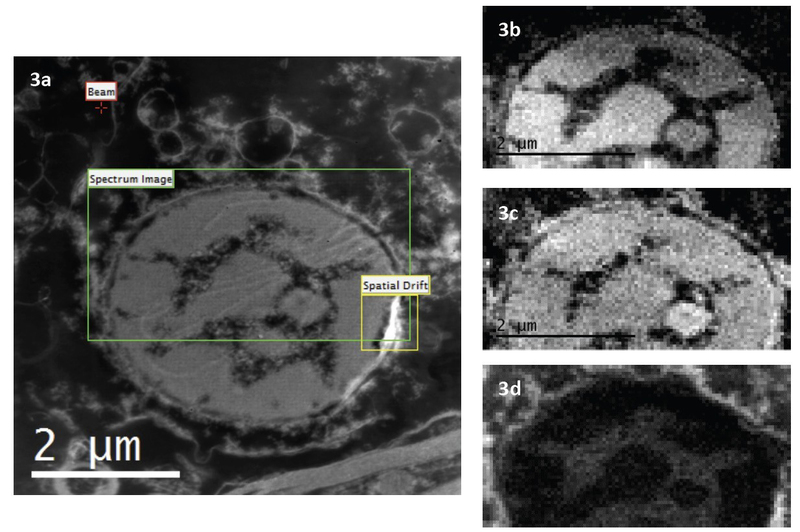 TEM images from biological samples show very little contrast. By energy filtering, the contrast in the image is greatly improved and details which seem to be lost in the unfiltered image are now visible as shown in Figures 1b, c.
By selecting an energy window around an ionization edge, it is possible to obtain images where the intensity is correlated to the concentration of a specific element. The signal of this element is superimposed on other signals such as diffraction contrast, thickness variation, elastic contrast and most importantly the background. In general the background can be removed using two different approaches: the two window and the three window method. In the former, image is formed by simply dividing the filtered image acquired just after the ionization edge by the one acquired from the region before the edge. In the latter method, two images prior to the edge give the background contribution which is determined by the power law. The background removal prior to the ionization edge is largely influenced by the position and width of the slit. The choice of these two conditions determines the size of the background and therefore the error after its removal. The best way to tackle this problem is to acquire a series of images where the position of the slit for each image is scanned over a certain region in the EELS spectrum. This is called EFTEM SI. In addition to pure filtered images, EFTEM SI stack contains spectroscopy information. An EELS spectrum can be extracted everywhere across the stack of images and the background can be placed accordingly giving the best fit.